Have you ever tried assembling a bookshelf yourself? You bring the box home, plop it in your living room, take out the pieces and get to work. Several hours and a few tantrums later, you’re done! …Only to realize that you’ve put pieces in the wrong places and the whole things looks less like a bookshelf and more like a scratching post for your cat. “What could’ve avoided this?” you ask. Well, not to be presumptuous, but I’m assuming you didn’t read the instructions. But don’t be sad! I’m guilty of it too! In fact, that’s the approach that many of us take when teaching ourselves Italian. We collect tons of Italian words and learning tools but then get frustrated when we aren’t speaking the language as beautifully as we wanted. Why does this happen? It’s because we’re not reading the instructions on how to create sentences! Knowing Italian sentence structure is extremely important to becoming fluent. If you don’t know where each piece fits into the larger sentence, you’ll wind up with “word salad” (the garbled Italian equivalent of the bookshelf-turned-cat scratching post!). In many ways, Italian sentence structure is very similar to English sentence structure, but it does differ from English in crucial ways. Further, like in English, there are a few types of sentences in Italian that you’ll need to be comfortable forming. 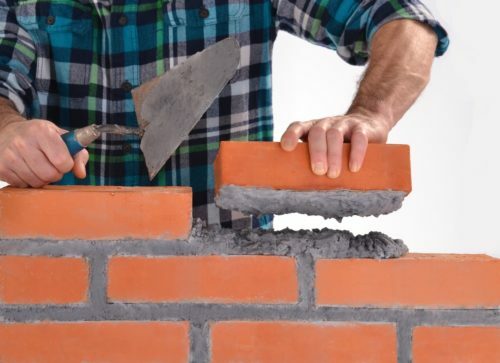 In this post, we’ll start with the basics—Italian simple sentences—then show you how to transform them or incorporate other elements. It’s not a problem if you feel just as shaky as that bookshelf when it comes to Italian sentence structure. Like we said, we’ll walk you through the fundamentals—then the best way to truly master Italian sentence structure is to practice it. 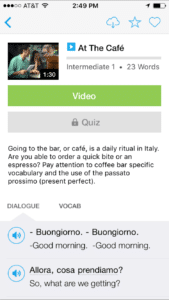 Check out the following resources for Italian sentence structure practice online! Try to unscramble sentences with these nine-question and 10-question quizzes from ToLearnFree. 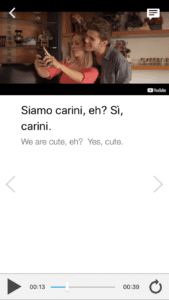 Watch real-world Italian videos on FluentU. Practice changing positive sentences into negative sentences with these exercises from the University of Vermont. You can do question-and-answer exercises from the University of Vermont as well. Now that your bookshelf is (hopefully!) all sorted out, let’s disassemble the Italian simple sentence so we can construct it properly. You’ll be happy to know that the Italian simple sentence should be very familiar. It’s composed of the exact same parts as an English simple sentence. In essence, the simple Italian sentence is identical to English in terms of word order: subject, verb, object. Luca is our subject (a proper noun) and dorme (sleeps) is our verb. Okay, simple enough! Let’s complicate this a little bit. The pizza is the object that’s being acted upon (eaten) by Maria, the subject. However, there’s one important difference between English and Italian. 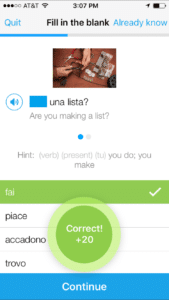 In Italian, you can omit the subject pronoun when the subject is implied by the sentence. For example, if you’re talking to Maria, you might ask her, “Mangi la pizza?” (“You’re eating pizza?”). It’s not necessary to say, “Tu mangi la pizza?” (“You’re eating pizza?”) because tu is implied simply by talking to her as well as the form the verb takes. In addition to direct objects that get acted upon (like the pizza in our example above), some verbs in Italian can take an indirect object. This is a rule that also applies in English. Indirect objects are generally introduced with the preposition a (to) and they come after the direct object. The direct object (un libro che ha comprato al negozio) is rather complex, so the indirect object must come before it to prevent confusion. To make a simple sentence negative, simply add the word non (not) before the verb. There are many ways we can make our sentences more complex. Check them out! The word francese is an adjective describing the type of book, so it comes after the noun (libro). Keep in mind that all adjectives (those that come before and after nouns) must agree with the gender of the noun they describe, just like verbs must agree with the subject they go with. The adverb lentamente comes after the verb in Italian, not before as in the English translation. The word molto (an adverb) is modifying the adjective freddo (cold), so it comes before the adjective. Prepositions normally accompany a noun (showing ownership) or a verb (showing direction or location) and come right after that noun or verb. The preposition di shows that Lucrezia owns la penna (the pen). One complication is that prepositions often combine with the articles that follow them to create contractions. The preposition a (to) combines with the article il (the) to create al (to the), showing us the direction we’re headed. Despite everything we’ve said about word order, there are ways we can change the simple sentence for different, equally important purposes. The most common spin on the simple Italian sentence is when we ask questions. To ask a simple yes/no question in Italian, we simply change the intonation of our voice (raise your voice at the end of the question). The question Hai una matita? (Do you have a pencil?) includes a raise of the voice on the word matita (pencil) to show we’re asking a question. To ask an open-ended question, place question words at the beginning of the question. The question Quanto costa? (How much does it cost?) is formed by placing the question word (quanto) before the verb. In this case, e (and) is combining two other separate sentences to create a longer one. Alright, Italian learner, now that you’ve learned how to assemble Italian sentences properly, maybe it’s time to disassemble that bookshelf and rebuild, following the instructions this time. You’re going to need some space to put all those Italian resources you’ll be acquiring!